How to grow seeds in a pot ? What a pleasure it is to see those little seeds burst forth into life as seedlings! Germinating seeds is not difficult but mothering the young plants requires care. Follow the guide ! To succeed at growing seeds you will need good equipment. 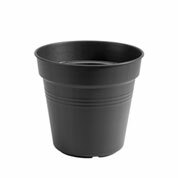 Firstly pots: made out of plastic and big enough, at least 10cm wide and the same in depth. Compost: that available from the shops is fine because it will not contain any weed seeds. 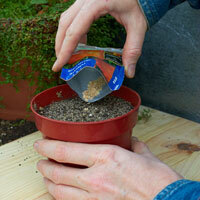 Begin by filling the pots with compost or sowing compost, firm it down and flatten it (use your hand or a flat object). 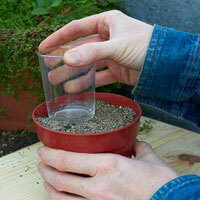 The growing medium should be about 2cm below the rim of the pot. Sow the seeds on the surface trying to space them out to about 5mm apart. 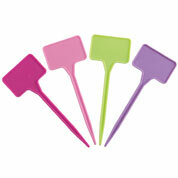 Cover them with a fine layer of compost about 5mm thick, not any deeper. Lightly pat them down so that the seeds stick in the growing medium. If the seeds are very fine then do not cover them: they will grow without anything above them. Do not forget to mark the name of the seed on the pot. 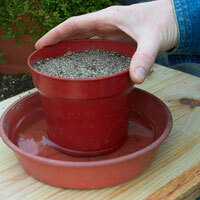 Put the pots in a 5cm deep saucer and fill it with water. Leave the contents of the pot to absorb the water for several hours. Sow the seeds on the surface trying to space them out to about 5mm apart. Firm it down and flatten it (use your hand or a flat object). Leave the contents of the pot to absorb the water for several hours. 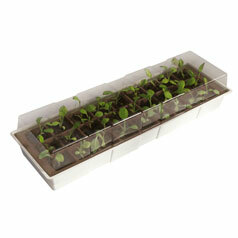 Put the pots in a place that is protected from the weather for example in a mini green house. 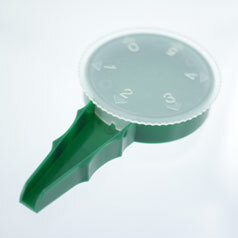 The temperature must be suitable for the type of seeds sown. Most plants need about 20°C, but certain ones demand a higher temperature (aubergines, basil, datura and other exotic plants). Others prefer a cooler temperature like primulas, wallflowers and all outdoor shrubs. 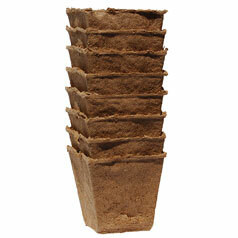 The sprouting time can vary between a week and several months. During this time always keep the soil damp and water gently or soak the pots from underneath. Regularly check the pots to spot anything that is growing. Once the seeds have germinated, there will be the new task of mothering them to undertake! Many gardeners believe the influence of the moon on seeds, it is however only a myth that has no scientific backing. Market gardeners and nurserymen do not worry about the state of the moon before planting their seeds and it certainly does not stop them from getting very good results !